Although there is much known about the role of BMPs in cartilage metabolism reliable data about the in vivo regulation in natural and surgically induced cartilage repair are still missing. Lavage fluids of knee joints of 47 patients were collected during surgical therapy. 5 patients had no cartilage lesion and served as a control group, the other 42 patients with circumscribed cartilage defects were treated by microfracturing (19) or by an Autologous Chondrocyte Implantation (23). The concentrations of BMP-2 and BMP-7 were determined by ELISA. The clinical status was evaluated using the IKDC Score prior to and 1 year following the operation. High level expression in the control group was found for BMP-2, concentrations of BMP-7 remained below detection levels. No statistical differences could be detected in concentrations of BMP-2 or BMP-7 in the lavage fluids of knees with cartilage lesions compared to the control group. Levels of BMP-7 did not change after surgical cartilage repair, whereas concentrations of BMP-2 statistically significant increased after the intervention (p < 0.001). The clinical outcome following cartilage regenerating surgery increased after 1 year by 29% (p < 0.001). The difference of the IKDC score after 1 year and prior to the operation was used to quantify the degree of improvement following surgery. This difference statistically significant correlated with initial BMP-2 (R = 0.554, p < 0.001) but not BMP-7 (R = 0.031, n.s.) levels in the knee joints. BMP-2 seems to play an important role in surgically induced cartilage repair; synovial expression correlates with the clinical outcome. Circumscribed cartilage defects are considered as an initial event in the progress of osteoarthritis (OA) . In the last decades different methods have been developed for treatment of this pathology. The Autologous Chondrocyte Implantation (ACI) and microfracturing are regarded as established procedures with documented success in prevention of OA-development. Despite clinical improvement one-third of the patients show early radiographic signs of OA five years after surgery independent from used kind of surgical management ; this indicates a certain potential for further necessary treatment perfection. Even though there is much known about cartilage metabolism including significant regulating mediators reliable data about in vivo regulation of natural cartilage repair and consequences of surgical interventions are still missing. Measurement of synovial mediator levels in the course of cartilage surgery seems to be a sufficient way to verify the so far collected data of in vitro or animal experiments. Therefore, this clinical study was initiated, in which lavage fluids of knee joints with cartilage lesions were prospectively collected and cytokine content was analyzed. After publication of the results gained for the regulators of cartilage metabolism bFGF and IGF-I , this article focuses on the role of the Bone morphogenetic proteins 2 and 7 (BMP-2, BMP-7) that both are recognized as candidate growth factors with good potential in cartilage tissue engineering as well as cartilage repair. BMP-2 and BMP-7 belong to the transforming growth factor-beta (TGF-β) superfamily, consisting of TGF-βs, growth differentiation factors, BMPs, activins, inhibins, and glial cell line-derived neurotrophic factor . BMPs have been identified as very potent inducers of bone, but since then it has become evident that their function is not limited to skeletal development . BMP-2 expression is not only found in mesenchymal condensation in embryonic development , but is also able to induce chondrogenesis in human mesenchymal stem cells in culture . For cartilage reparative reasons, BMP-2 can be used to induce chondrogenesis by coating scaffolds with BMP-2 before implantation . Thereby, the scaffold itself can be replaced by the original tissue. This can be combined with culturing mesenchymal stem cells or tissue specific cells on the coated scaffold to gain de novo tissue formation in the scaffold . Mechanical injury was found to upregulate BMP-2 as well as BMP-2 signaling in human cartilage explants . This could indicate that BMP-2 is upregulated as a reparative response but could also indicate that BMP-2 is merely upregulated as a pathological side effect, thereby further stimulating injury. BMP-7, also known as osteogenic protein-1 (OP-1) has demonstrated a great potential in bone repair applications. Both BMPs received the regulatory approval as commercially available proteins supporting bone repair i.e. in case of delayed union. It has been shown that BMP-7 also exhibits characteristics as a cartilage anabolic factor because of the ability to induce matrix synthesis and promote repair in cartilage. Data collected so far suggest a significant role for BMP-7 in cartilage repair concerning both articular and disc cartilage applications . The purpose of this study was the in vivo evaluation of the potentially chondro-protective and chondro-anabolic cytokines BMP-2 and BMP-7 in knees with circumscribed cartilage lesions and to determine if the cytokine profiles correlate with the clinically assessed knee function. Since the expression patterns for aggrecan, bFGF, IGF-I, and IL-1β and the regulation of the intraarticular total protein content have already been characterized and published , correlations of these proteins with the clinical outcome were evaluated in addition to the analysis of BMP-2 and 7. Furthermore, the question should be answered whether surgical procedures of cartilage regeneration lead to an up-regulation of both BMPs that in future might be used as a prognostic factor or to support cartilage healing. The study was performed as previously described . Briefly, 47 patients were enrolled in a prospective clinical trial between August 2006 and September 2007. Selection of patients followed the criteria as defined beneath. The study was approved by the Ethical board of the University of Freiburg (AN-EK-FRBRG-335, study number DRKS00000365 and UKF001822). An informed consent was obtained from every subject included in the study. The ACI surgical technique has been well defined in numerous publications [13–15]. In all patients a matrix (Chondro-Gide®, Geistlich Biomaterials, Wolhusen, Switzerland) associated technique for chondrocyte fixation has been used. Microfractures were generated with specially bent awls (Chondropic™, Arthrex®, Karlsfeld, Germany) by creating V-shaped perforation holes with a diameter of 1.5-2 mm at a distance of 3 mm (3-4 holes/cm2) . The applied kind of cartilage surgery was chosen depending on defect size and depth according to the schema of therapy as previously published . Synovial lavage fluids of knee joints of patients undergoing surgery were intraoperatively collected. Before starting the procedure, 20 ml of sterile physiologic saline was instilled into the joint cavity. The saline was mixed within the joint by repeated passive flexion-extension and repeated manipulation of the supra-and infrapatellar regions, and then was aspirated as described by Geborek et al.. This method has been successfully used by a variety of other groups [18–20]. The total volume aspirated was recorded (6.0-10.5 ml). Specimen were centrifuged in order to separate the cells and then stored frozen at -80°C until analyzed. An intraarticular drainage was usually placed; the collected fluid in the drainage bottles was used for analysis of mediator concentrations at day 1 and 2 post surgery. Drainages were removed according to medical necessity defined by the secretion volume per day (< 50 ml/24 h). 5 patients undergoing a diagnostic arthroscopy for unspecific knee complains had no cartilage lesion and served as a control group, in case of the other 42 patients the cartilage defects were treated by microfracturing (19 patients) or by an Autologous Chondrocyte Implantation (23 patients). No patient was operated for a fracture. The average age of the patients with cartilage lesions was 42 ± 10 years, the gender distribution was equal (21/21). The average age of the control group was 30 ± 12 years; the male individuals slightly prevailed (2/3). The body mass index (BMI) of the intervention group was 26.9 ± 3.5, the BMI of the control group was 25.0 ± 3.74. Outcome measures were the Lysholm Score , the IKDC Score , the Noyes Score , the Medical Outcomes Study Short Form-36 (SF-36), and visual analog scales (VAS) for knee pain strength and frequency. Of the 42 patients with surgically treated cartilage defects initially entered into the study protocol, 1-year follow-up data were available in 38 patients (84%). Four patients, two in each intervention group, refused the postoperative follow-up. The questionnaire was done not earlier than after 12 months and not later than 13 months after surgery. The amount of chondral damage was graded from 0 to 4 based on the ICRS classification  Grade 0 represents normal articular cartilage and grade I shows superficial lesions as soft indentation and/or superficial fissures and cracks. A grade II defect is a partial-thickness defect; it features lesions extending down to less than 50% of cartilage depth. With grade III defects, there are cartilage defects extending down to more than 50% of cartilage depth as well as down to the calcified layer, and down to but not through the subchondral bone. Blisters are included in this grade. In grade IV injuries, the subchondral bone is exposed and ruptured. The total area of chondral defect per patient was calculated by adding the regions with grad III and grade IV lesions. According to this standardized choice of treatment the average defect sizes were 3.4 ± 2.0 cm2 in case of microfracturing, and 6.1 ± 2.6 cm2 in case of ACI (p < 0.001). In order to measure concentrations of the indicated proteins, commercially available ELISA kits provided by R&D Systems (Wiesbaden-Nordenstadt, Germany) for BMP-2, BMP-7, bFGF, IGF-I, IL-1β and BioSource (BioSource Deutschland GmbH, Solingen, Germany) for aggrecan were used according to the manufacturers' instructions. Briefly, the assay employs the quantitative sandwich enzyme immunoassay technique. A specific MAb was pre-coated onto a microplate. Supernatants were applied to the wells and, after washing, an HRP-conjugated specific Ab was added to the wells. Following the next wash, color development was proportional to protein concentration and was calculated by comparison with a standard. A colorimetric method was used in order to quantify total protein amount in the lavage fluids. The bicinchoninic acid (BCA) assay was available in kit form from Pierce (Rockford, Ill., USA) and was used according to the manufacturers' instructions. In principle, BCA serves the purpose of the Folin reagent in the Lowry assay, namely to react with complexes between copper ions and peptide bonds to produce a purple end product. Extinction was read at 562 nm within one hour. All values were expressed as mean ± standard deviation. Data sets were examined with one-and two-way analysis of variance (ANOVA) and individual group means of protein or cytokine concentrations were then compared with the unpaired or paired Student's t-test, individual group means of scores were compared with the Wilcoxon rank sum test. Normal probability plots were done on all data sets and correlation determined by either calculating the Pearson (R)-or the Spearmen (Rho) coefficient depending on distribution. The power for comparing two means based on the normal approximation method was reported where indicated. Statistical significance was defined when P < 0.05. The clinical outcome following regenerative cartilage surgery after 1 year was evaluated using the IKDC and the Lysholm Score. The IKDC Score increased by 29% for all patients undergoing either an ACI or microfracturing from 34.6 ± 15.1 points to 49.1 ± 17.5 points (n = 38, p = 0.0002). The increase for patients treated by ACI was 29% (n = 21, p = 0.0029), for patients undergoing microfracturing 30% (n = 17, p = 0.026). The Lysholm Score increased by 21% for all patients undergoing either an ACI or microfracturing from 52.9 ± 21.1 points to 67.4 ± 19.1 points (n = 38, p = 0.004). The increase for all ACI patients was 18% (n = 21, p = 0.03), for all patients treated by microfracturing 26% (n = 17, p = 0.03). Furthermore, sports activities were evaluated using the Noyes Score; a trend for an increase without statistical significance (preoperative 215 ± 74.81 points to postoperative 235 ± 58.99 points, n = 38, p = 0.06) was seen when assessing all patients together independent on kind of surgery. The effect of operative treatment on pain perception was examined using a visual analogue scale. Both pain-strength and pain-frequency improved statistically significant by 30% (6.5 ± 2.0 vs. 4.5 ± 2.4, n = 38, p = 0.00025) and 25% (7.6 ± 2.1 vs. 5.7 ± 2.2, n = 38, p = 0.00029), respectively. In order to evaluate the influence of the knee function improvement on life quality the SF36 was used. An increase for the physical health (34 ± 9 vs. 38 ± 10, n = 38, p = 0.08, 9.3%) and the mental health (50 ± 11 vs. 51 ± 11, n = 38, p = 0.68, 1.4%) was found without statistical significance. The data are summarized in table 1. The average concentration of BMP-2 in the lavage fluids of knee joints with cartilage lesions was 120.60 ± 65.22 pg/ml (n = 42), this was not statically significant different from the concentrations in the knees with intact cartilage (110.07 ± 26.16 pg/ml, n = 5, p = 0.72, power 9.43%). BMP-2 expression did not correlate with cartilage defect size; average expression in both intervention groups (ACI and microfracturing) did not statistically significant differ (121.90 ± 83.44 pg/ml vs. 119.03 ± 34.30 pg/ml, p = 0.14). At day 1 following surgery an average BMP-2 concentration of 185.07 ± 89.98 pg/ml (n = 28) was measured what means a statistically significant increase (p < 0.0001, power 91.3%) of BMP-2 levels after surgery. BMP-2 concentrations in the knee joints remained at a high level compared to baseline at day 2 following surgery (296.14 ± 64.19 pg/ml, n = 6, p < 0.0001, power 100%, figure 1). BMP-2 Course. 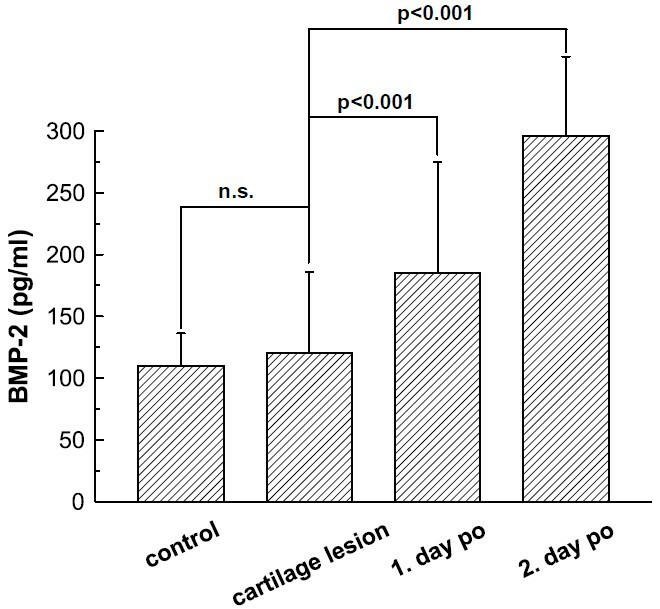 BMP-2 content in lavage fluids of knee joints without cartilage lesions (control, n = 5), with cartilage damage (n = 42), following cartilage surgery at day 1 (n = 28) post operation (po), and following cartilage surgery at day 2 (n = 6) post operation. Groups were compared as indicated by the connecting lines, significance levels are specified. In all knees of the control group concentrations of BMP-7 did not reach detection levels. In the knees with chondral defects the average BMP-7 concentrations were very low (8.56 ± 24.22 pg/ml), in 26 knees with cartilage defects BMP-7 concentrations were below the detection level (figure 2). BMP-7 expression did not correlate with cartilage defect size; average expression in both intervention groups did not statistically significant differ (0.01 ± 0.22 pg/ml vs. 8.56 ± 24.22 pg/ml, p = 0.44, power 57.94%). There was no statistically significant change in BMP-7 levels at day 1 post surgery (8.56 ± 24.22 pg/ml vs. 57.25 ± 137.89 pg/ml, n = 28, p = 0.09, power 46.56%), and no significant difference of BMP-7 levels comparing day 1 and day 2 (6.53 ± 7.23 pg/ml, n = 6, p = 0.26, power 5.98%) after the operation. BMP-7 Course. 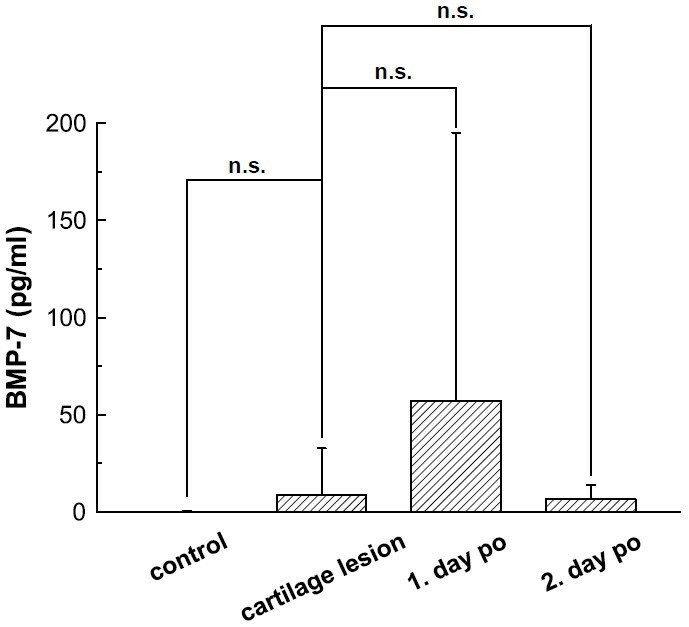 BMP-7 content in lavage fluids of knee joints without cartilage lesions (control, n = 5), with cartilage damage (n = 42), following cartilage surgery at day 1 (n = 28) post operation (po), and following cartilage surgery at day 2 (n = 6) post operation. Groups were compared as indicated by the connecting lines, significance levels are specified. For the analysis of a possible association between initial synovial cytokine levels and the clinical outcome after 1 year the statistical correlation was calculated. The clinical outcome was defined as the difference of the IKDC or the Lysholm Score after 1 year and prior to the operation that mirrors the individual improvement for each case. There was a statistically significant medium correlation between initial BMP-2 levels and the IKDC Score differences with a Pearson coefficient of 0.554 (p = 0.0003, figure 3), and a significant low correlation of BMP-2 concentrations with the Lysholm Score differences with a Pearson coefficient of 0.378 (p = 0.019). The analysis of the treatment subgroups showed a high correlation of BMP-2 levels with the IKDC Score differences in the patients treated by microfracturing (R = 0.822, p = 0.00005) and a medium correlation for the patients treated by ACI (R = 0.535, p = 0.01). Furthermore, the correlation analysis has been performed for the total protein content and the concentrations of aggrecan, bFGF, IGF-I, and IL-1β (n = 38). None of these intraarticular measured proteins demonstrated a statistically significant association with the clinical outcome defined by the differences of the IKDC Scores or the Lysholm Score (table 2). Quantification of these cytokines and data about postoperative regulations have already been published . Neither synovial BMP-2 nor BMP-7 levels correlated with age (n = 47, R = 0.26, p = 0.29 and R = 0.06, p = 0.60) or BMI (n = 47, R = 0.10, p = 0.50 and R = 0.22, p = 0.13). 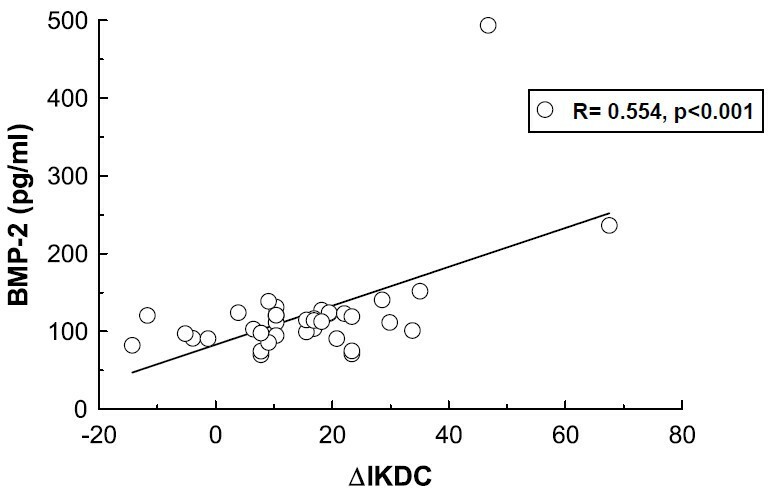 Overview about the correlation strength between the changes of the IKDC Score evaluated initially and after 1 year with initial intraarticular cytokine levels of BMP-2, BMP-7, IL-1β, bFGF, IGF-I, aggrecan and the total protein content. The only statistically significant correlation was found in case of BMP-2 (R-Pearson coefficient, Rho Spearmen coefficient). In order to look for possible regulative associations between the investigated cytokines the statistical correlation between intraarticular levels of IL-1β, IGF-I, bFGF and BMP-2 and -7 was calculated. There was no statistically significant correlation between synovial concentrations of IL-1β, IGF-I, bFGF and the examined BMPs (n = 47, p > 0.08 for all correlations). Many in vitro studies and animal experiments gave significant insights into the role of BMP-2 and BMP-7 in cartilage metabolism and repair; however, data about in vivo regulation in humans are ambiguous or still missing for certain clinical situations. Therefore, data about intraarticular levels of BMP-2 and BMP-7 in knees with circumscribed cartilage lesions and their correlation with clinical scores are introduced. Although for both examined BMPs anabolic effects on cartilage were described the data presented suggest a more heterogeneous picture. Our data demonstrate significant levels of BMP-2 in the synovial fluid of all knees without dependency of the presence or the size of a cartilage lesion. This generally indicates a role for BMP-2 in joint metabolism. Furthermore, increased concentrations of BMP-2 were measured following the cartilage regenerating operation. This might be explained as a consequence of the surgical manipulation of the cartilage defect boarder and the arthrotomy as it has been shown for bFGF, IGF-I or IL-1β . But BMP-2 was the only intraarticular cytokine which correlated with the degree of clinical improvement measured by the IKDC Score. Since it has been shown that the clinical outcome correlates with the degree of cartilage regeneration  it may be concluded that BMP-2 plays a significant role in cartilage repair and metabolism. This is in concordance with other studies showing BMP-2 stimulated murine proteoglycan synthesis and BMP-2 induced enhancement of collagen type II expression in chondrocytes seeded in alginate [25, 26]. Also, in species like rats and humans, BMP-2 was able to stimulate the chondrogenic phenotype on the mRNA level and induced cartilage extracellular matrix proteoglycan production [27, 28]. Further studies  have added a partial catabolic effect on cartilage ECM indicating a regulative role for BMP-2 in ECM maintenance, especially during inflammatory induced turnover. This was confirmed by a study that demonstrated a decisive role for BMPs in osteophyte formation and synovial thickening during OA , although the presented data do not allow concluding that BMP-2 plays an important role in the onset of OA, because healthy patients also expressed intraarticular BMP-2. Similar to the effects of BMP-2 stimulation of cartilage-specific extracellular proteins as collagens type II and VI, aggrecan, decorin, fibronectin, hyaluronan [31–34] has been shown in vitro for BMP-7 (OP-1). It induced anabolic responses in normal and OA chondrocytes from both young and old donors and did not cause expression of cartilage hypertrophy markers or changes in their chondrogenic phenotype [35–37]. BMP-7 was synthesised by human articular chondrocytes [36, 38] of different age and various degrees of degeneration including OA, but the level of gene and protein expression was dramatically reduced with cartilage aging and degenerative destruction [36, 37]. BMP-7 was mainly localized in the cartilage layer , but was also detected in the synovial knee fluid of patients with OA and rheumatoid arthritis (RA) . This articular distribution suggests a decisive paracrine effect of BMP-7, correlating with the finding that intraarticular measured levels are lower than the effective concentrations determined in vitro. In conformity with our data the mature and active BMP-7 could not be found in human synovial fluid of normal knees in a recently published study . The degree of degenerative changes seems to influence the intraarticular concentration and possibly induces the conversion of a BMP-7 pro-form into the mature and active protein . This is supported by the data of Honsawek et al., who described increased BMP-7 levels in knees of patients with progressive OA  The circumstance that in our trial only patients with circumscribed cartilage lesions were included (and patients with advanced OA were excluded) may make clear why synovial concentrations were mainly found below the detection level and, therefore, did not correlate with the clinical score. Since for both examined BMPs pro-forms  have been described, the role and function of these precursor proteins still need to be analysed. The statistically significant correlation of BMP-2 levels with the clinical outcome was only found using knee specific scores. In contrast, scores reflecting overall live quality (SF 36) or physical activity (Noyes) failed to show this association. This might be explained by the fact that these scores are influenced by much more parameters than knee function. That the aspect knee functionality plays an important role is shown by the difference between the physical and the mental component summary of the SF 36. Inclusion of more patients could possibly lead to a statistical significance regarding live quality or overall physical activity. Although cartilage repair and inflammatory joint reactions are usually associated with pain and loss of function , this study could neither demonstrate regulatory associations between both examined BMPs and the inflammation-triggered IL-1β nor between BMPs and the mediators of cartilage metabolism IGF-I and bFGF. This might be explained by the fact that direct regulations in vivo are rare; usually cytokines are controlled on different regulatory levels making a distinguished mediator release dependent on several affecting components possible. The study does not allow drawing any conclusions how BMP-2 is acting; we even may not determine what part of the operation -arthrotomy or cartilage surgery itself-induces the increase of BMP-2 levels. It also remains unclear what molecular mechanisms are behind the observed association. But the spectrum of BMP-2 effects concerning cartilage repair and differentiation is rapidly growing [42, 43]. We also may speculate that BMP-2 plays a role in nervous tissue regeneration, thereby influencing pain perception. A further interesting aspect is the question, whether BMP-2 concentrations are linked to differences in bone turnover induced by damage of the subchondral bone layer during surgery. This hypothesis would be supported by the better correlations seen in patients undergoing microfracturing compared to ACI patients. After all, the study does not allow explaining the BMP-2 induced reactions. This limitation is caused by the plain observational characteristic of the study. We speculate that the cartilage in the near surrounding of the defect and the synovia may play an important role controlling BMP-2 release and that the assembly of the different receptors influences BMP-driven effects . Therefore, a histology study was initiated in order to localize BMPs and their receptors in the different regions of interest in the joint. This will give the possibility to include other promising representatives of the BMP-family with cartilage influencing properties as BMP-4 . Strong evidence has been collected so far that both examined BMPs play a significant role in cartilage repair. Our data could confirm intraarticular presence of BMP-2 in patients with circumscribed cartilage lesions. The concentrations were increased following cartilage regenerating surgery and statistically significant correlated with improvement of functional knee scores. Therefore, BMP-2 seems to play a significant role in cartilage maintenance and repair. The study was funded by Deutsche Arthrose-Hilfe e.V., Germany. All authors disclose any financial and personal relationships with other people or organizations that could potentially and inappropriately influence (bias) their work and conclusions. HS was responsible for the conception and the final design of the study, for obtaining of funding, the analysis and interpretation of the data, tutorial of co-authors, and writing of the article. PN performed most operations und by this provided study material, acquired patients, and contributed to data management with his statistical expertise. JZ contributed to the analysis and interpretation of the data, and supported the laboratory part of the study. FS was responsible for the collection, assembly and management of data, performed the ELISAs, and calculated the scores and the descriptive statistics. NPS was involved in the conception and design of the study and the trial protocol, provided study material, contributed to obtainment of funding, and gave administrative support. AM was involved in the conception and the design of the study and the trial protocol and gave significant input in the fundamental considerations of the role of BMP-2 (and its pro-form), and also contributed to the obtainment of funding. All authors read and approved the final manuscript.